I haven’t blogged in a really long time, but I just finished this quilt, which I’ve been working on slowly for a while. Each (of the 225!) colored squares is one inch. I picked the size because it was so easy to translate from my graph paper sketch. I made the sketch quickly–just coloring squares without a whole lot of thought and ended up with a surprising sort-of hidden pattern that reminded me a little of fair isle knitting. I wasn’t sure how the sketch would translate to a quilt, but I followed it almost exactly. The top is made of 25 blocks with 9 colored squares each. I first thought about making long strips, but breaking the design into blocks really helped keep the grid neat. Here are some close-ups where the pattern disappears. This entry was posted in quilts on July 17, 2016 by brigitdermott. The palette for this quilt was inspired by the Pantone colors for 2016–rose quartz and serenity. The colors are unabashedly pretty and seemed just right for a baby quilt. The background fabric is handkerchief linen in a soft white and the center square is a Liberty print–gray Betsy, which I one of my absolute favorites. I added a smidge to the pink binding. I am tempted to make a quilt using the colors in the print–the olive green and coral are so unexpected and wonderful. 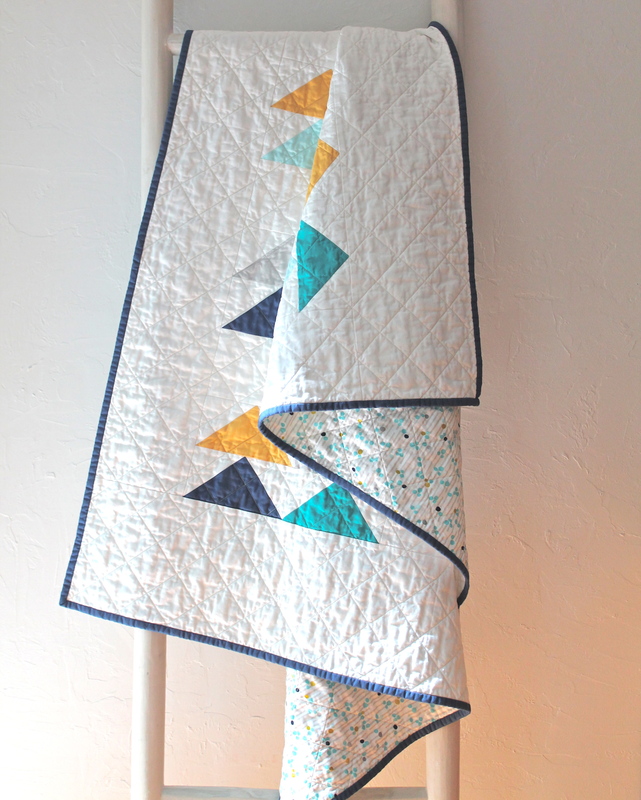 This simple, pretty quilt was a nice way to start the new year. Now I’m ready to tackle some of my goals for 2016. My Etsy shop (etsy.com/shop/BrigitGail) has been growing–slowly, but steadily–without much nurturing, so this year I want to see how I can help it along. I really struggle with social media and marketing–but I am determined to get better at this. I think the trick is to find platforms that work for your personality. Instagram is a friendly space for introverts–pretty pictures of quilts I can manage! I also want to try a few new things–submitting a project to a magazine is first on my list. Are you looking to try something new in 2016? I’d love to hear what’s on your list! This entry was posted in quilts and tagged Etsy, Liberty of London, modern baby quilt, modern quilt, quilt design on January 27, 2016 by brigitdermott. I finished this modern version of a double wedding ring quilt just in time for my parents’ 50th anniversary. As much as I love making gifts for my family and friends, I always find it a little worrying. With the exception of baby knits, which can’t fail to charm if you are a halfway decent knitter, I worry that the gift will be a burden or somehow attention hogging–look what I made! Despite my worries, my parents seemed genuinely to like the quilt, and I was really pleased with how it turned out. The quilt is a throw-size (60×60), which was about the maximum size my little Janome Gem can handle with ease. Then, like “The Gift of the Magi” but much happier, my parents gave me a wonderful new (full-size, super fantastic) sewing machine for Christmas, one week after their anniversary. Truly, the most amazing gift! Especially, since I never would have bought a new machine myself. All this to say, when my sewing friends gently suggested that trying to run a quilting business using what is essentially a pocket-sized machine was perhaps a little foolish, I protested that my little Janome was just perfect. While I adore my trusty old machine, this new machine (a Juki TL2010Q) is a revelation. I can’t believe how precisely and quickly it sews. How was I to know that a machine could make such a difference? (Hmm, perhaps by listening to people?) I think the heaviness of all the parts and the machine itself must keep everything steady. I feel so professional, and I have already completed three quilts–a new one for my shop and two custom quilts. But, I have to say, my little machine did a pretty good job on my parents’ quilt–some of the curves don’t quite meet up but the overall effect is pretty pleasing. This entry was posted in quilts on January 21, 2016 by brigitdermott. The Quilted Adventure Online Retreat has officially started. The first project–from my lovely friend Vanessa Vargas Wilson, the Crafty Gemini–is a super cute baby quilt made with zero fabric waste. Since I rarely use my scraps (insert guilty feelings here), I love this aspect of her project. It’s not too late to sign up! The community is just getting started and you will have access to all the released content for the full year. If you haven’t experienced Vanessa’s bubbly, accessible teaching style you are in for a treat! This entry was posted in quilts on January 20, 2016 by brigitdermott. I’ve been thinking about making this quilt for some time and after lots of cutting out pieces it was so fun to start laying out the design. I wasn’t sure how I to arrange the pieces so I just went for random placement and (ta-da!) I think it looks great! I really love this pattern by Liz Harvatine aka Lady Harvatine. 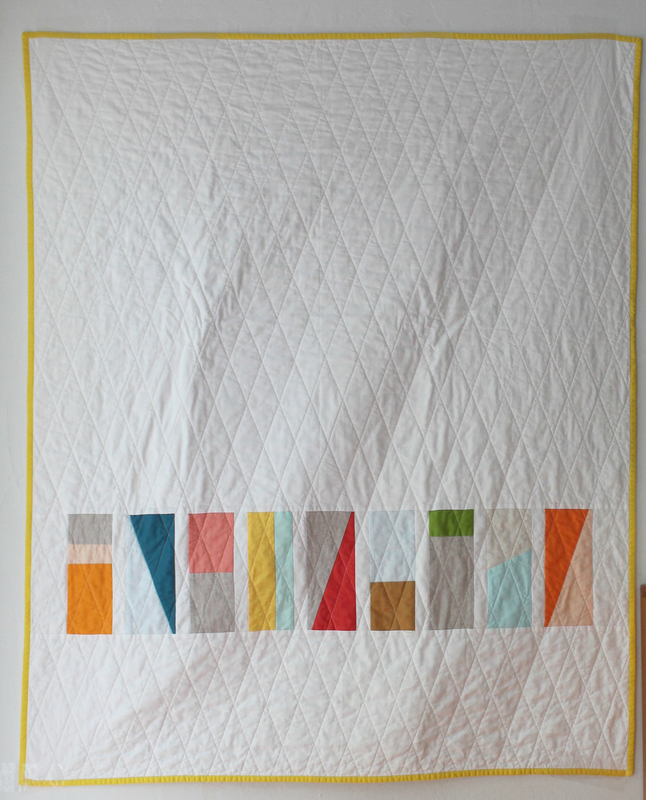 Liz is a member of the Los Angeles Modern Quilt Guild and she designed this block for their block of the month series. The quilt is for my parents’ 50th wedding anniversary. I wanted to make a variation on a double wedding ring quilt with gold tones and this pattern makes it modern. I especially like how some of the circles are broken (see that gap on the left? ); it gives the design a really nice fluid feel. I’m starting the piecing tonight. I hope I do OK with all those curves. If you know of any tutorials for piecing curves I’d love to hear about them! Linking up with WIP Wednesday on Freshly Pieced! This entry was posted in pattern, quilts and tagged double wedding ring quilt, Lady Harvatine, modern double wedding ring on November 3, 2015 by brigitdermott. Just finished the last of a flurry of custom orders! It has been so much fun working on quilts that I know are going to happy homes. This cutie is for a baby on the way in Texas. Baby quilts are my absolute favorite size to make. I work on a Janome Gem, which I recently learned is 3/4 size (! ), and even though I’ve made a few queen size quilts on it, it’s much happier working on a smaller scale. 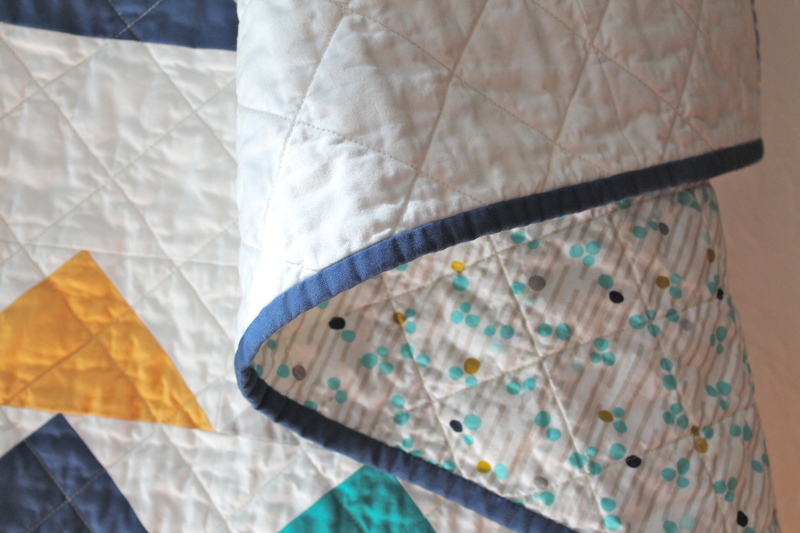 The backing for this quilt is a great organic cotton that I happened to have on hand–it’s such a perfect fit with the colors my client picked. I love that it has a little shimmer in some of the dots. My shelves in my little shop are pretty bare but it’s time to work on some things for my house and holiday presents. Up next, a tablecloth for Thanksgiving and leaf coasters. Plus a surprise quilt that I am super excited about. 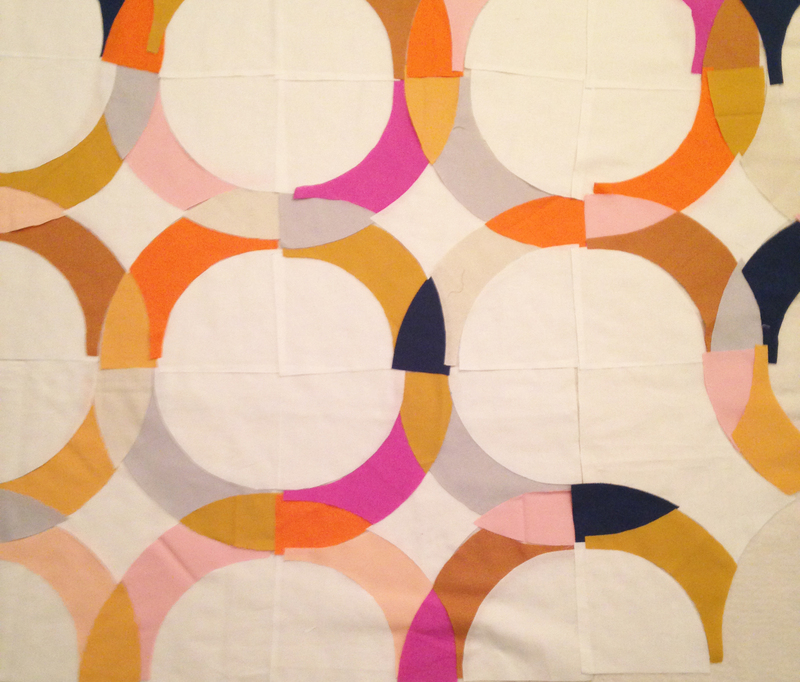 I’m going to post about this quilt as I go, so more posts on this WIP coming soon. This entry was posted in kids stuff, quilts and tagged baby quilt, custom quilt, flying geese quilt on October 25, 2015 by brigitdermott. Domino quilt kit–chance to win! In my class for the Quilted Adventure online retreat, I am teaching how to make this super cute (and easy!) baby quilt. If you are a beginner, this is a great first baby quilt. The piecing is very simple and un-fussy, and you are only making nine blocks. The only part that is not so great for beginners is that the pattern requires small pieces of fabric in a bunch of colors. If you’re new to quilting, you might not have a big stash of scraps, but fear not! I am offering a chance to win a free domino quilt kit with a coordinated set of correctly sized scraps in a variety of colors and neutrals to the first twenty people to register for Quilted Adventures using the link below! I’ll have kits in four selected color ways to choose from in my Etsy shop once the retreat goes live. But, if you register now, I’ll enter you to win a free kit of your choice. That’s a one in twenty chance of winning all those lovely colors! This entry was posted in Quilted Adventures, quilts and tagged domino quilt, fabric scraps, give away, modern domino quilt, quilt kit, quilted adventures on October 20, 2015 by brigitdermott.